I received an email from Dr. Dailey last week and this is how it started “If ‘ifs and buts’ were candies and nuts, every day would be Christmas”. After reading the rest of the email I asked his permission to post it on the blog and he was gracious enough to grant me permission. I believe you’ll find his thoughts insightful and they may even cause you to reflect a bit. If “ifs and buts” were candies and nuts, every day would be Christmas. This is an old Southern saying that makes reference to someone who always has plenty of excuses. I like to shorten it to simply, “candies and nuts.” Candies and Nuts is about personal responsibility, ownership and moving forward. Where does BED come from? B.E.D. stands for blame, excuses and denial. One thing is certain about BED behavior, it gets you nowhere and there are always more excuses and blame down the road. Patch one pot-hole and two more appear in its place. It yields no improvement, no inner peace and quite frankly if we don’t all face it we continue behavior that we try to adjust in our children, and the myriad of other people who don’t take ownership for their circumstances and situation. It allows us to ignore causality and dismiss the situation as simply unfair and unworthy of real focused and accountable effort. That sounds like a hopeless, hapless and helpless situation. We can either continue in that hopeless state, change or wish it all away. If wishes were horses, then beggars would ride. I think wishing for all the uncomfortable things to go away is magical thinking and maladaptive and again won’t fix much. There is hope. The graphic below depicts the predicament and the solution. We have a choice. Above the line or below the line, where do you want to be? We all dip above and below occasionally. Some people have brief bursts below the line and others live there. 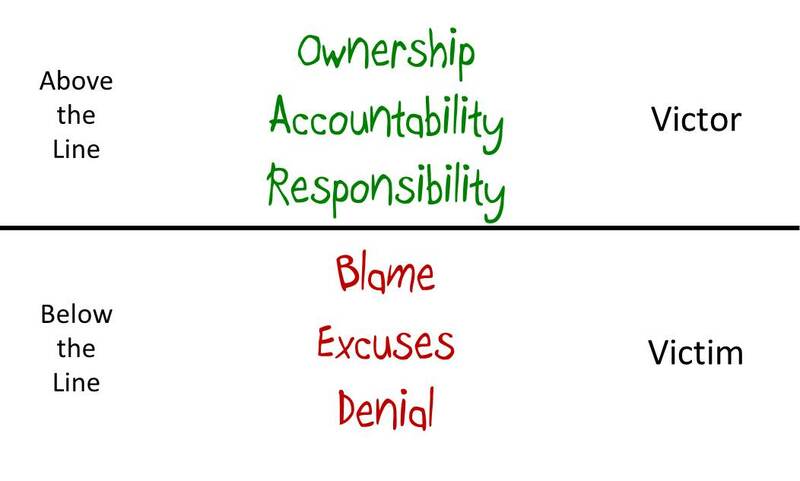 It takes recognition of this behavior in ourselves and constant vigilance to try to stay “above the line” and out of BED with our candies and nuts.